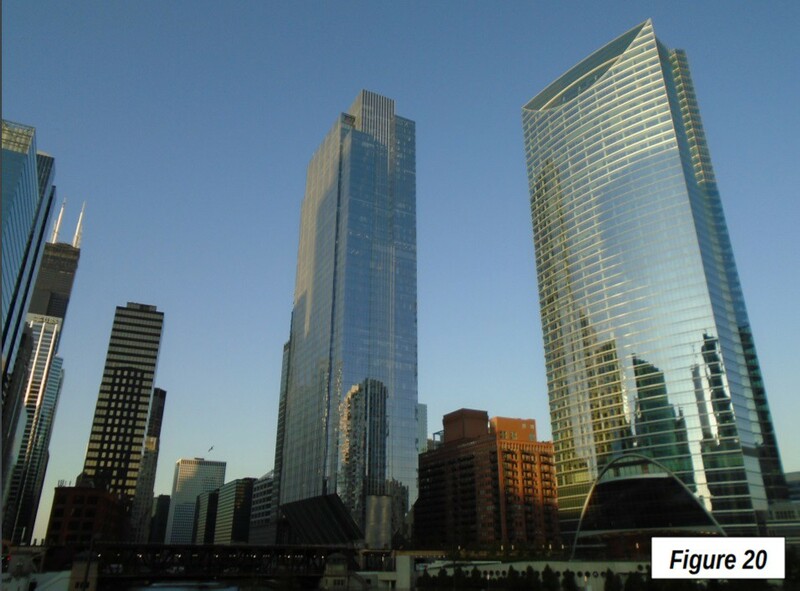 Chicago has a storied history in skyscraper development, so much so that it has been called the birthplace of the skyscraper. 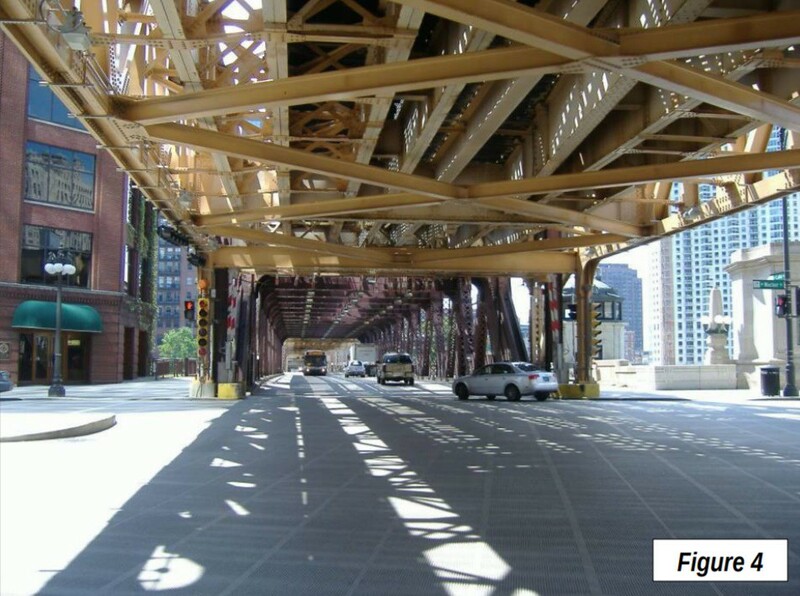 Nearly all of that history occurred in and around the “Loop,” which is the historic downtown, or central business district (CBD). 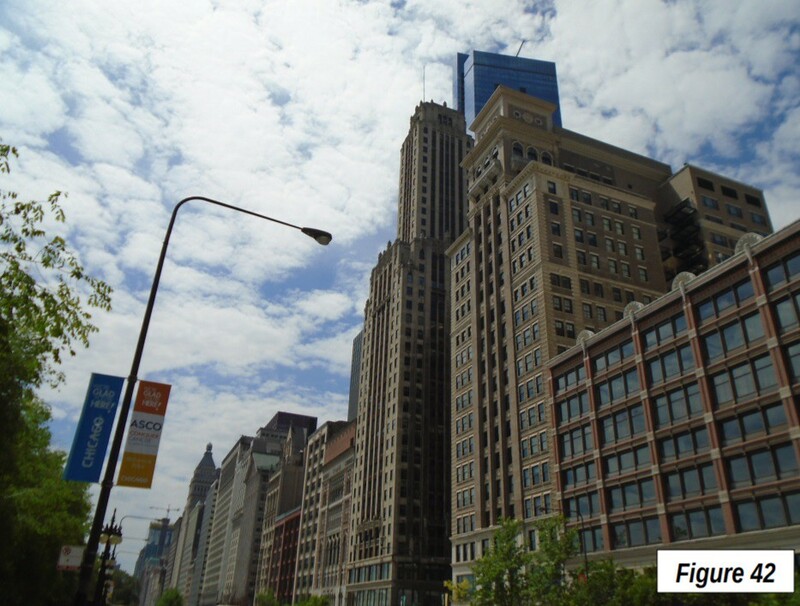 Recently, I took the opportunity to walk around the Loop, to photograph buildings, old and new. A feature of the modern skyscraper is the use of steel frames for support, with external facing hung on the outside (Note 2). This replaced the former approach, which relied on masonry for support (such as brick), but had to be increasingly wide to support the heavy structure. 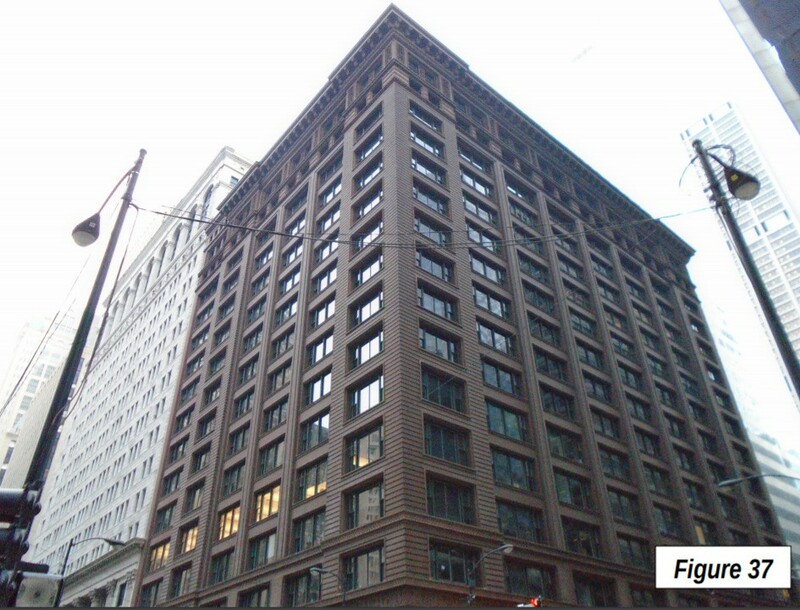 This limited the height of buildings before steel frames became standard. 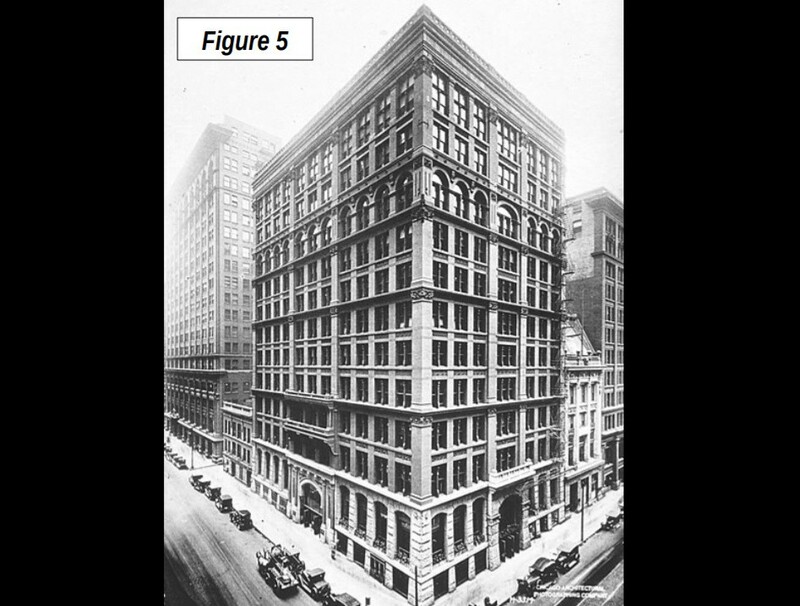 There are claims that the world’s first skyscraper was in Chicago, the 9, (later 11) story Home Insurance Building, built in 1885 and then demolished in 1931 (Image 5, Note 3). 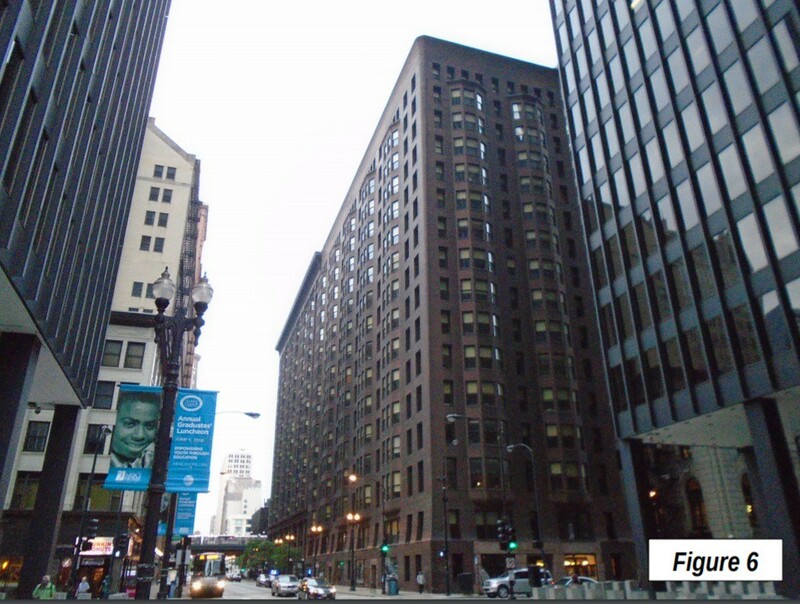 One of Chicago’s buildings has roots in both eras. 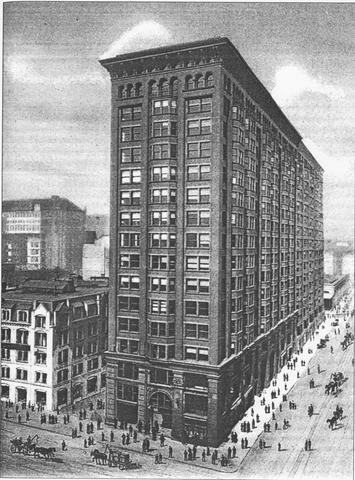 The northern half of the Monadnock Building (photograph above), located with its south entrance on Van Buren Street, was the world’s largest office building when it opened in 1893. It was built in the traditional way, with its outside walls supporting the structure. 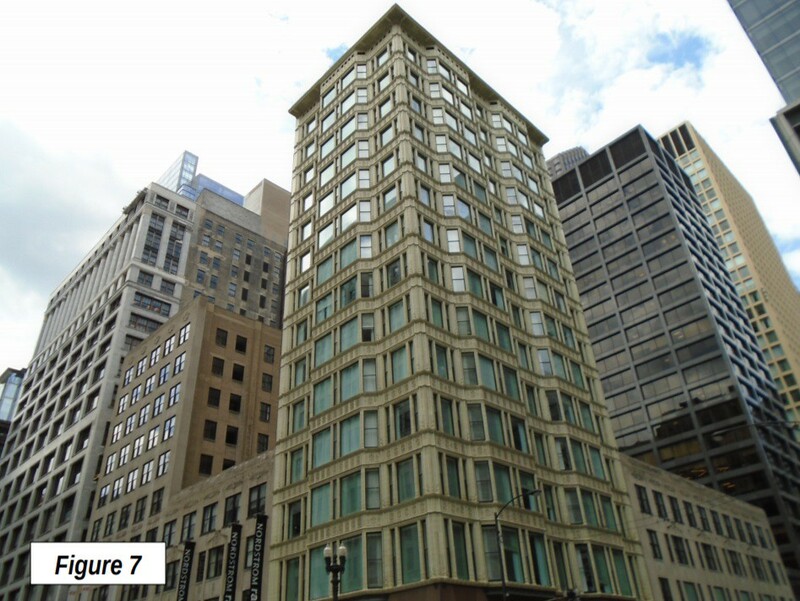 This 17 story northern structure is reputed to be the tallest such masonry supported commercial building in the world, shown at the corner of Jackson Boulevard and Dearborn in Image 6. The base of its outer brick walls is six feet thick. About the same time the northern half was opened, work began on the southern half. Most of this structure was built with masonry, but the southern-most quarter of the same height was built with a steel frame. 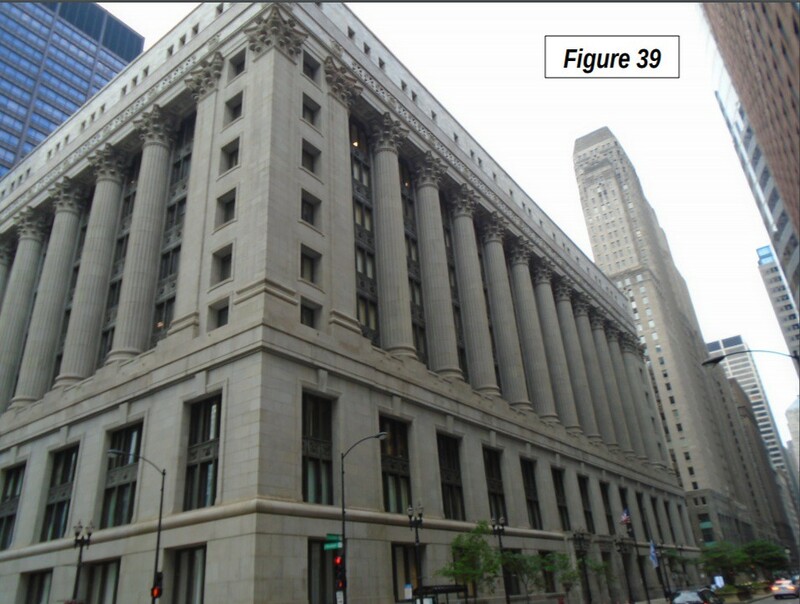 The former Chicago Savings Bank Building, another heritage building, opened in 1905 (Image 7). The building is now the Alise Hotel. 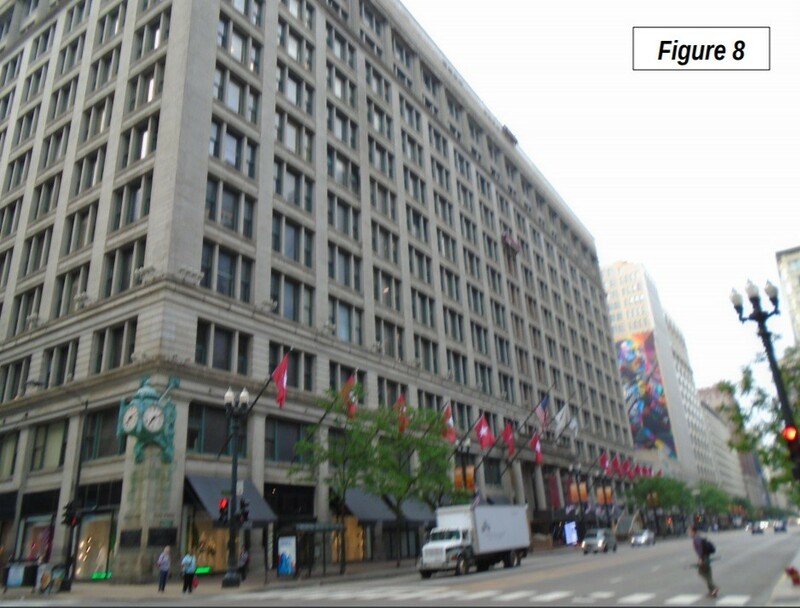 Diagonally, it is across the intersection of State and Washington from the former Marshall Field department store (now Macy’s), shown in Image 8. 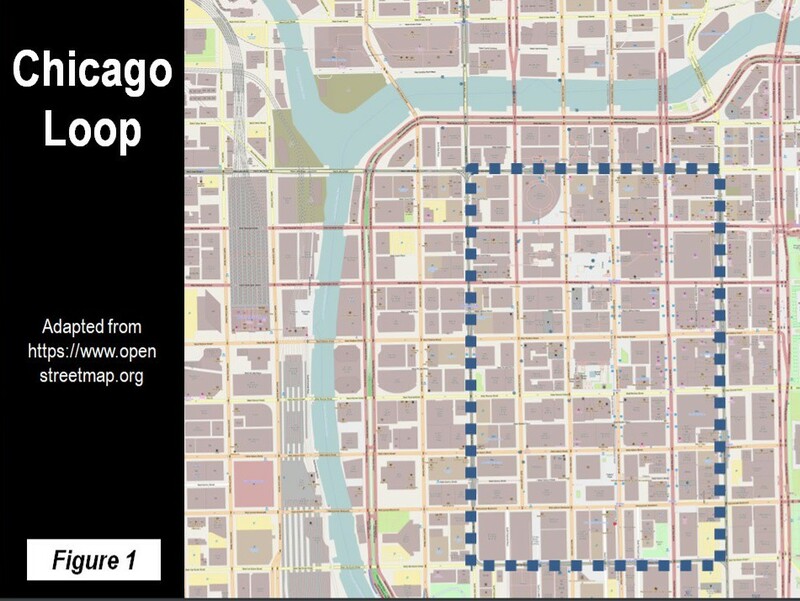 Some of the Loop’s most iconic buildings are in the Northwest Loop, many outside El loop. 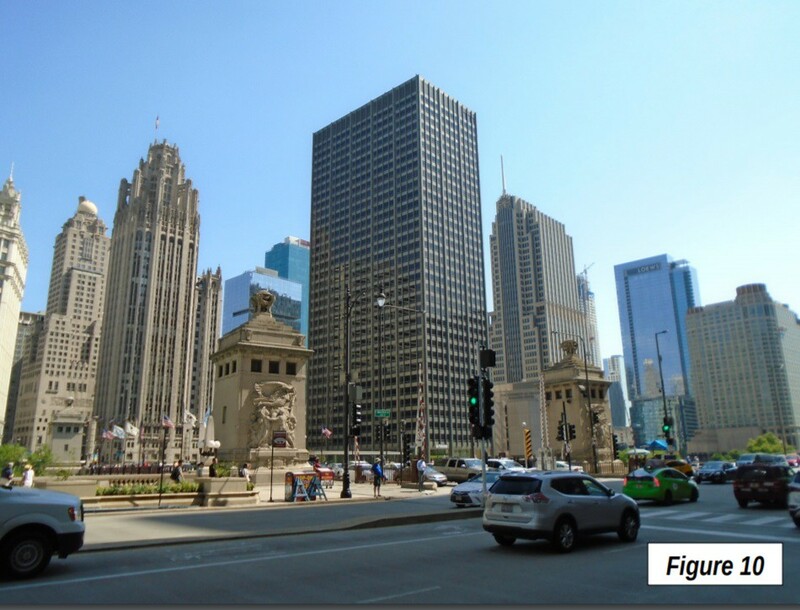 The Tribune Tower and the Wrigley Building, the pair opposite one another on North Michigan Avenue may have been the most frequently photographed buildings in Chicago. 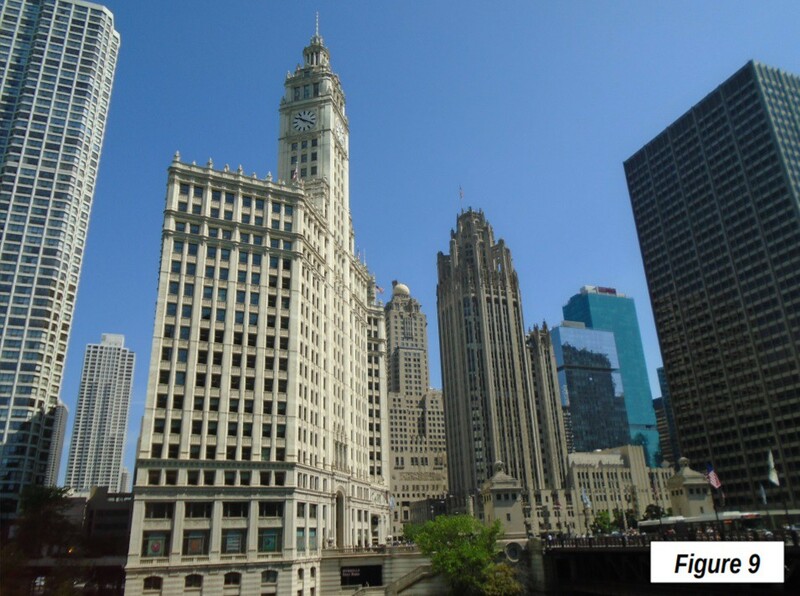 The Wrigley Building is white and to the left, and the Tribune Tower is tan with its neo-Gothic features and both are north of the Chicago River, which is famously dyed green every St. Patrick’s Day (Image 9). 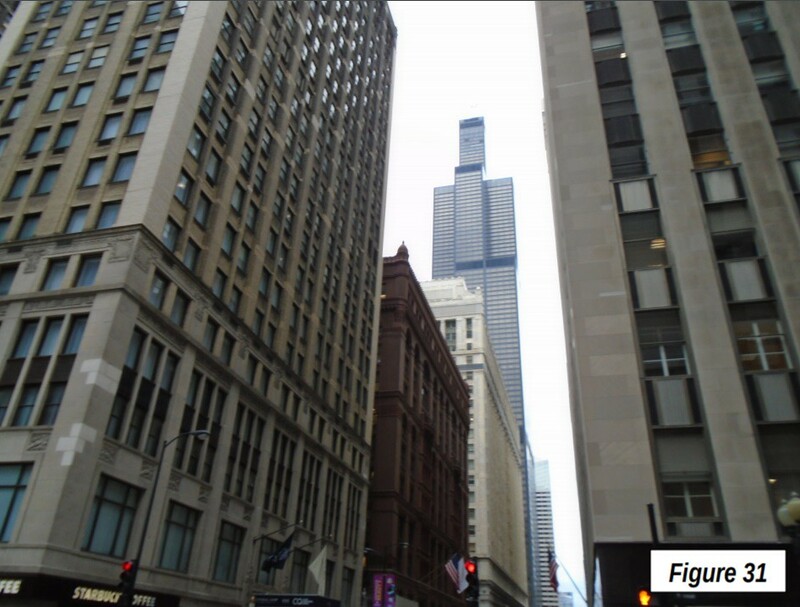 Not even the much taller Willis Tower (formerly the Sears Tower) or the John Hancock Tower, which both opened to considerable fanfare much later, are more frequent symbols of Chicago. 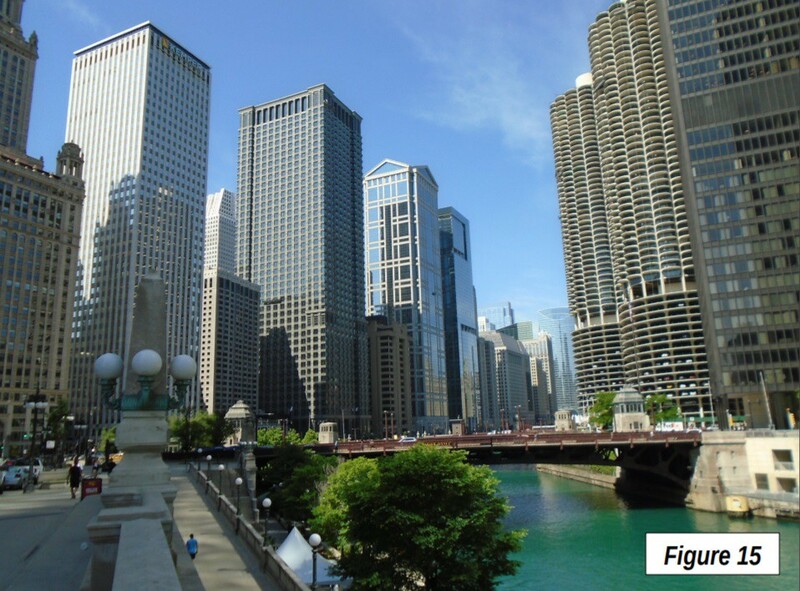 Image 10 shows the Tribune Tower, with the Intercontinental Hotel behind and newer structures to the north of the Chicago River to the right. 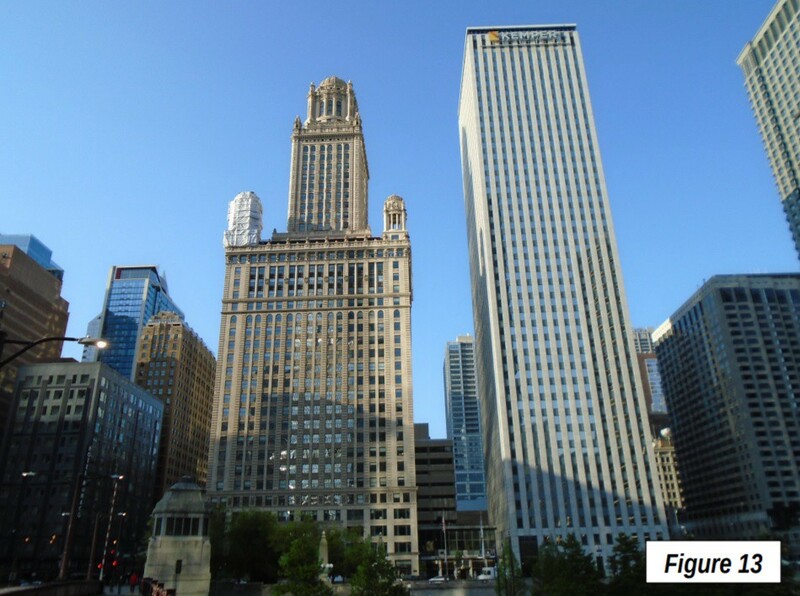 Just to the west of the Wrigley Building, also north of the river, is the Trump International Hotel and Tower, with its 98 floors, rising to 1,389 feet (423 meters). 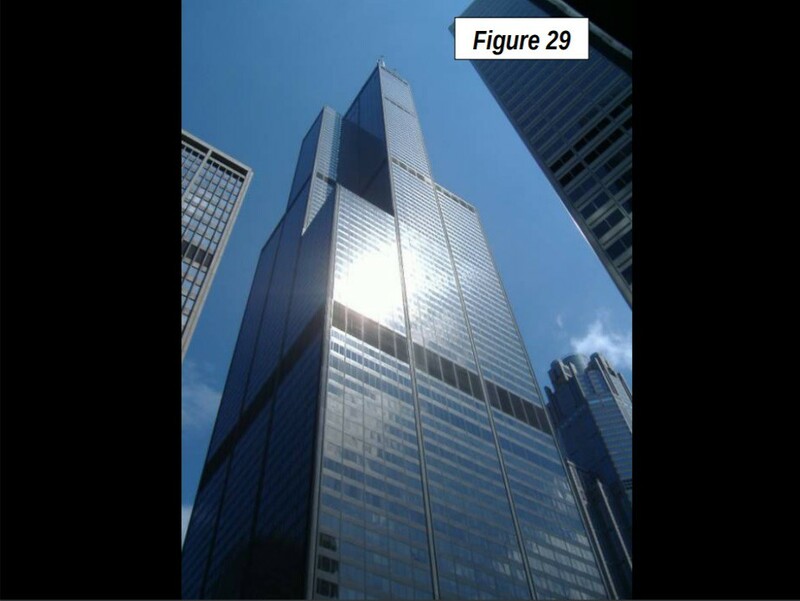 It is Chicago’s second tallest building, fourth tallest in the United States and 23rd tallest in the world (Image 11). The Mather Tower is just south of the river, obvious for its narrow floors. 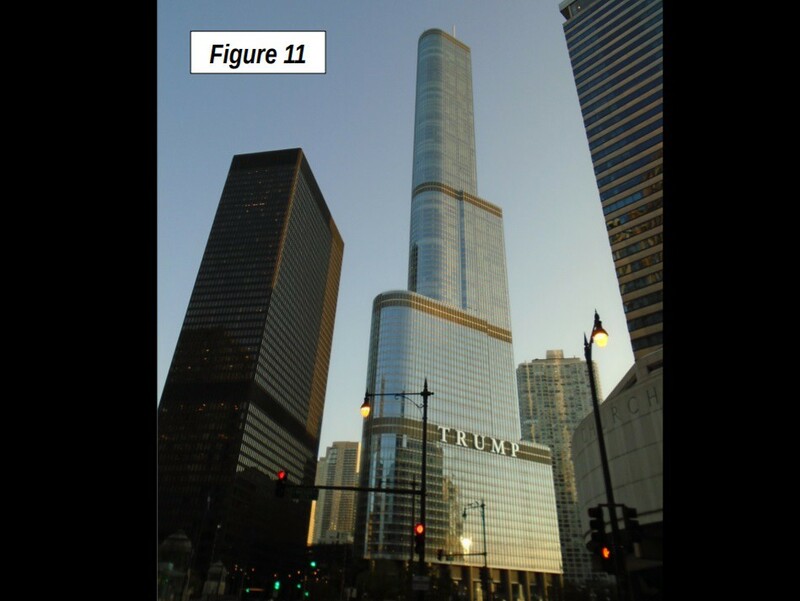 The more than 500 foot tall building opened in 1928 (Image 12). 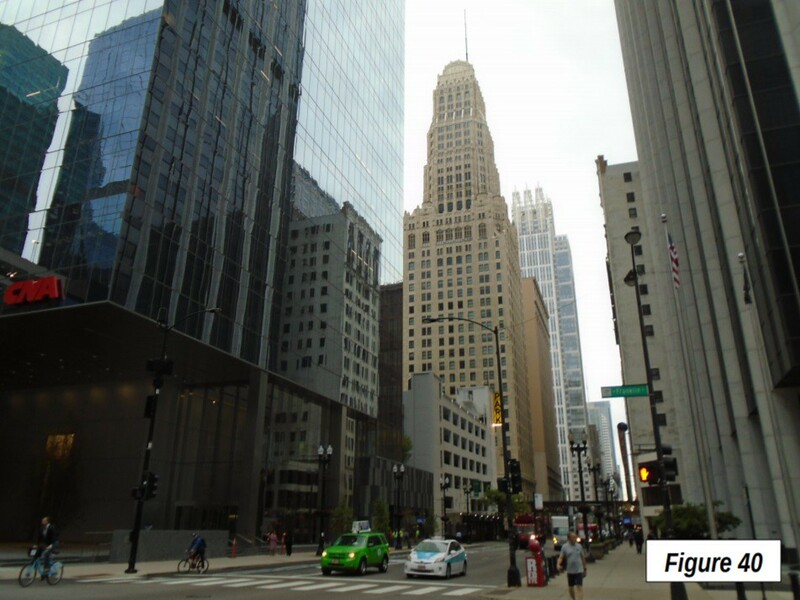 To the right is the 35 East Wacker Drive building (originally called the “Jeweler’s Building), with its ample base, supporting a narrower, but still bulky tower, and smaller towers on each of the four corners. 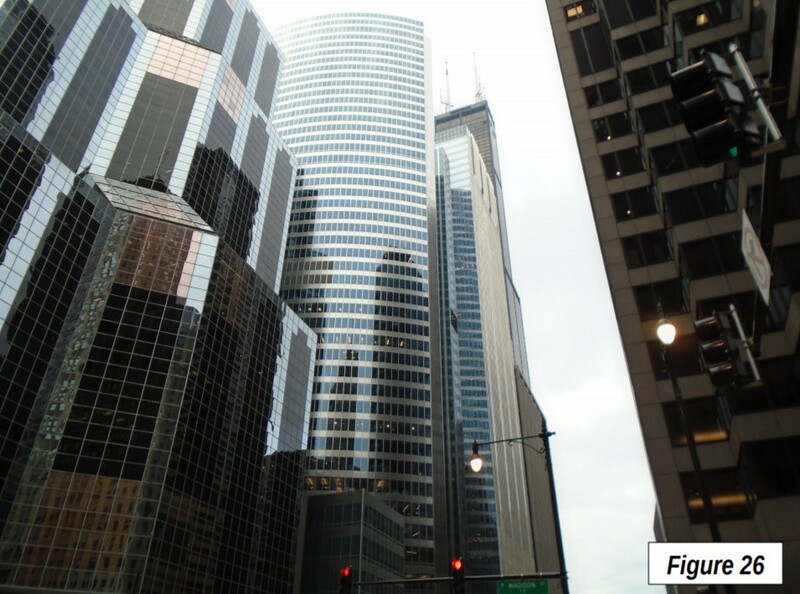 When built opened in 1927, 35 Wacker Drive was the tallest building in the world outside New York. The building was designed for the automobile age, with parking on the first 24 floors, providing adjacent access to offices. The parking was removed in 1940 because cars had become too wide for the elevators (Image 13). The twin towered Marina City is one of the most unique high-rise residential developments in the nation, at 587 feet (189 meters) and 65 stories (Figure 14). 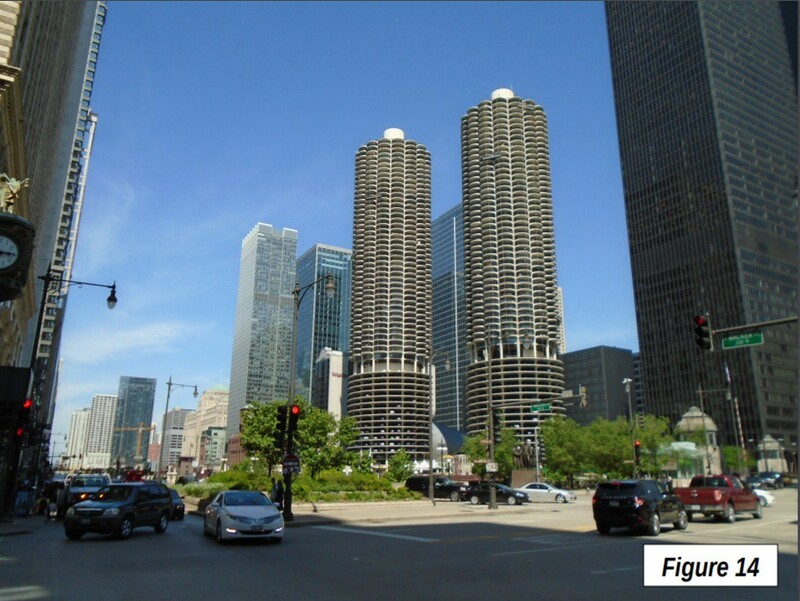 The towers were opened in 1968 and sit on bases of 19 parking floors, with the cars unusually visible to the outside. 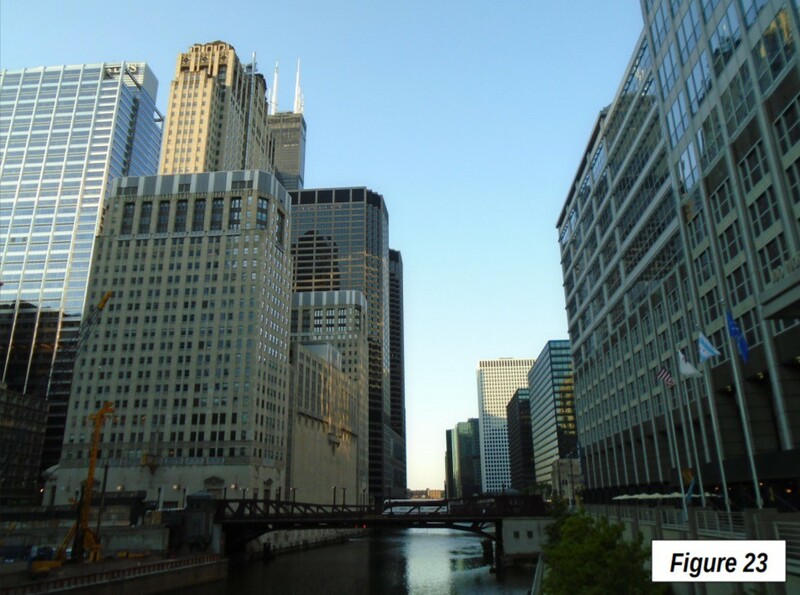 Across the Chicago River, oriented west to east here, and Wacker Drive are a wall of modern buildings (Image 15) with a view further west toward Merchandise Mart. 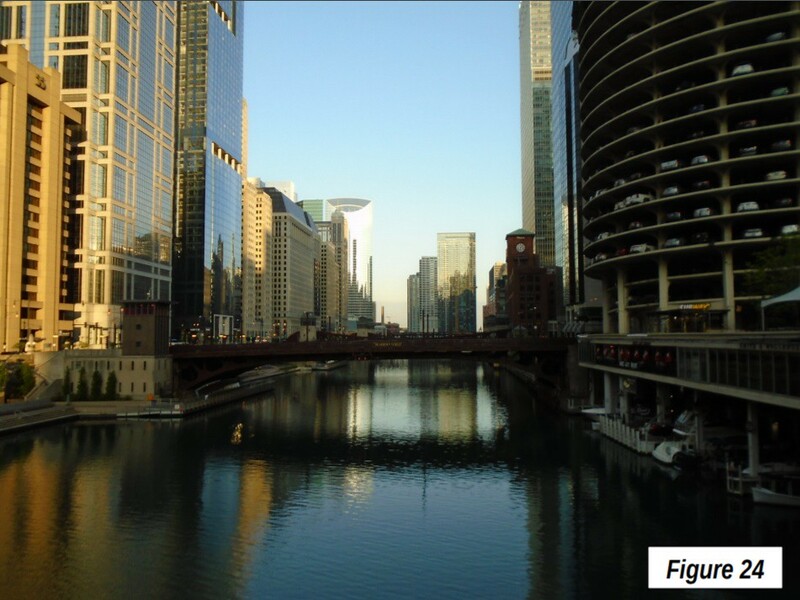 The Chicago River is oriented east to west (Image 16). 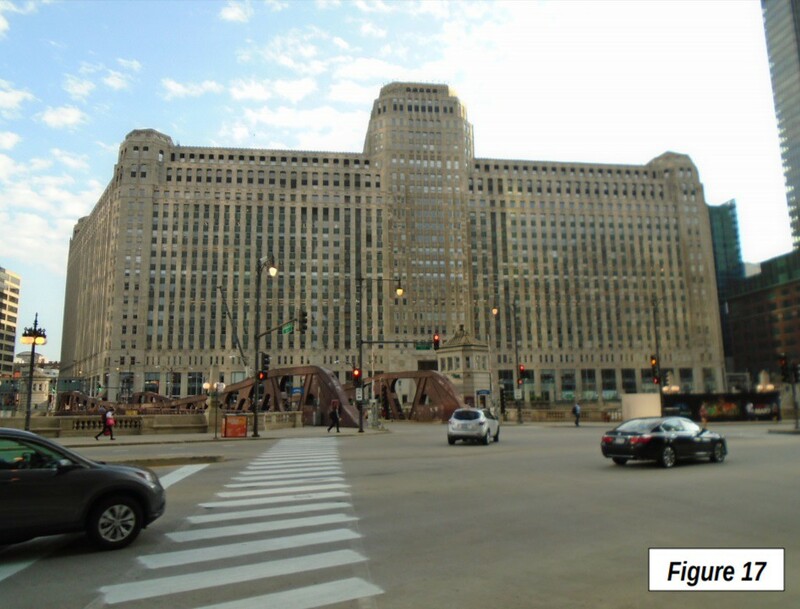 Merchandise Mart, another building fronting on the north side of the river was the largest building in the world when opened in 1929 (Image 17). 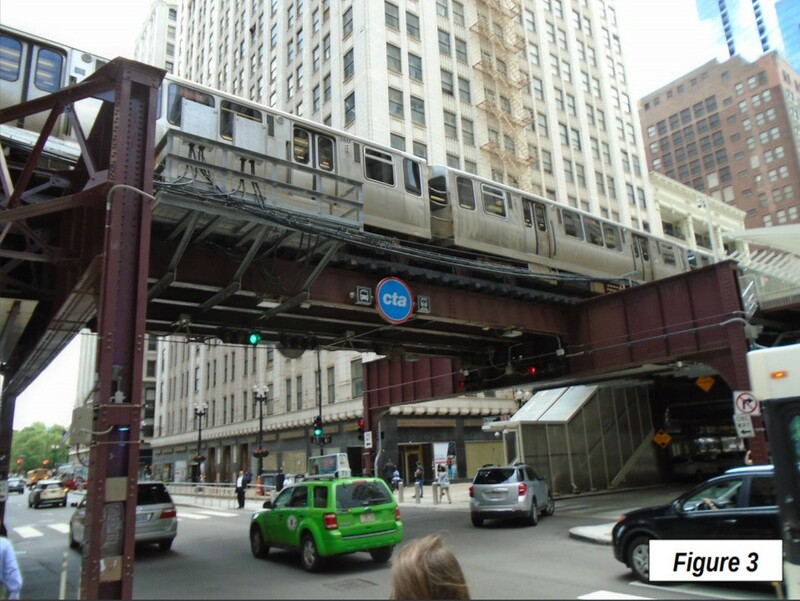 The turn of the El at Lake and Wabash is shown in Image 18. 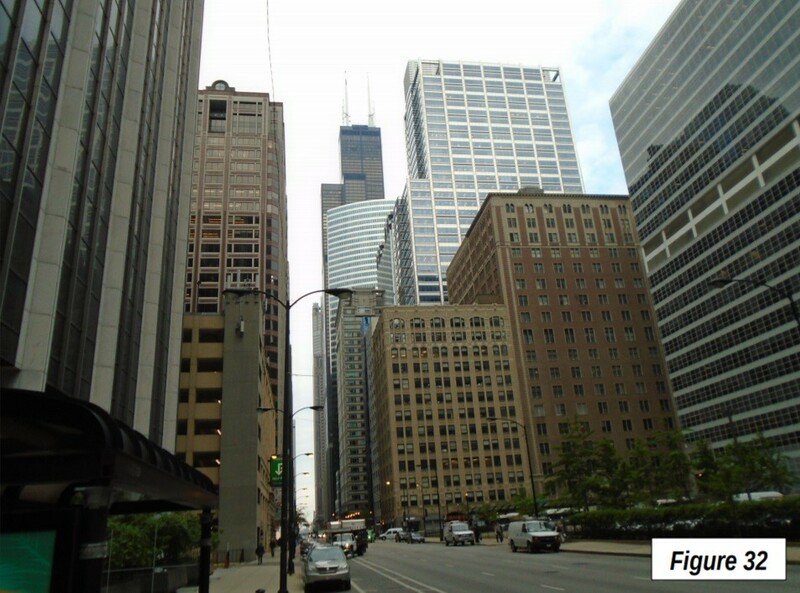 Wacker Drive begins a north-south orientation just west of Merchandise Mart (Images 19-21), with the Willis Tower in the distance. 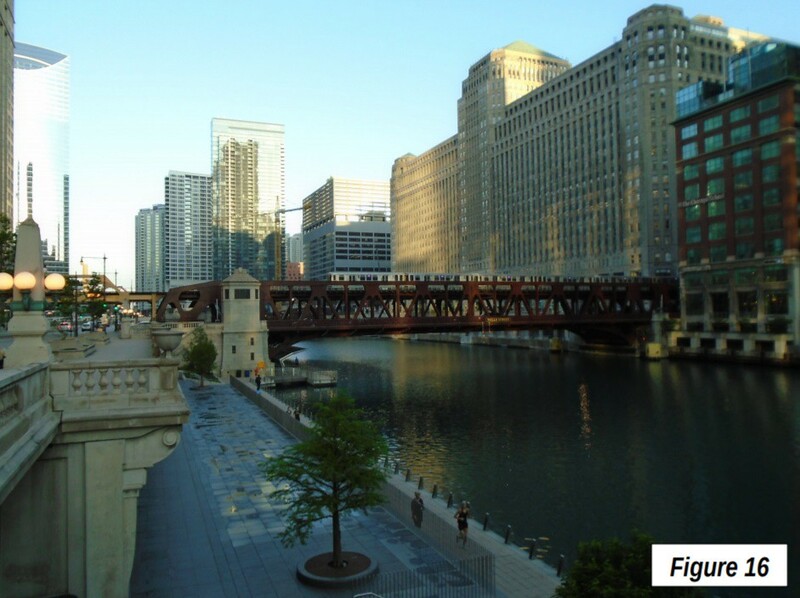 The Chicago River, also now oriented north-south, courses behind the Civic Opera Building (Images 22-25). 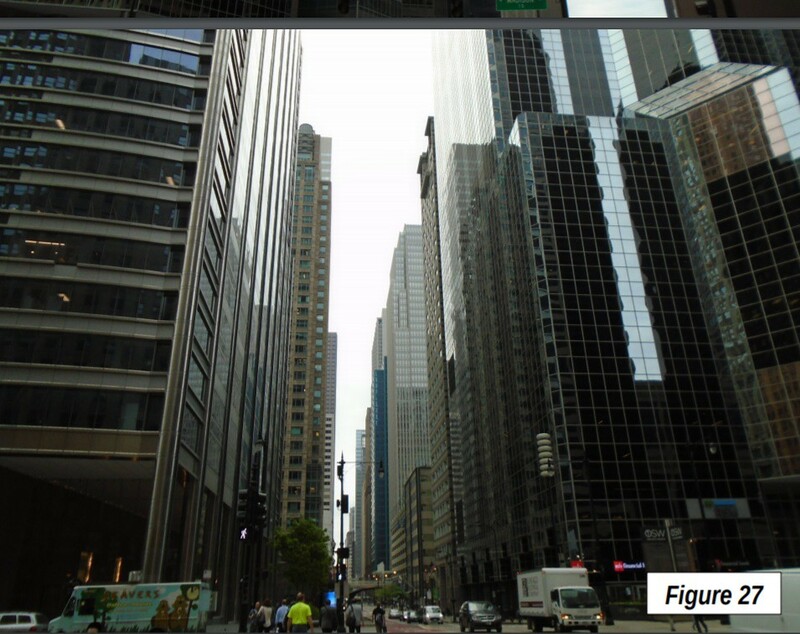 Extremely high commercial building densities can be found on South Wacker Drive (Image 26). 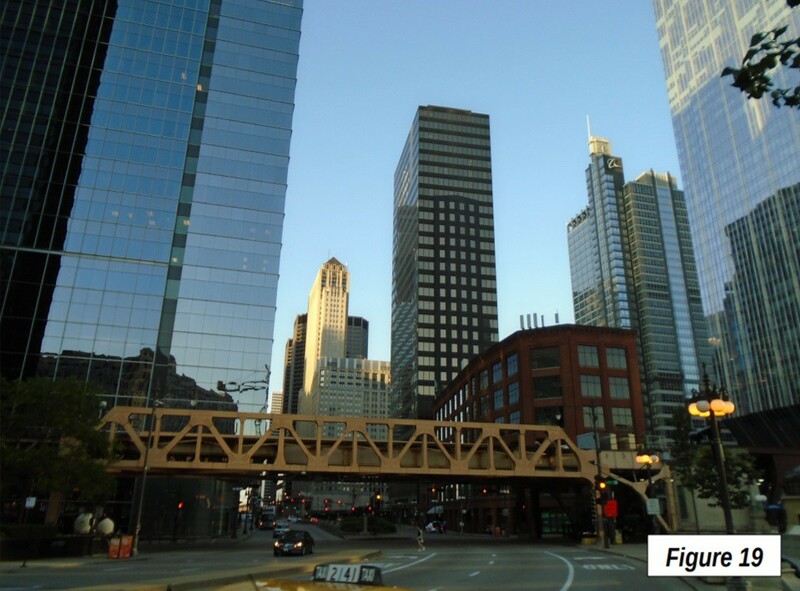 One of Chicago’s many skyscraper canyons, Madison Street (Image 27) with its sidewalks used by thousands of commuters to and from the Ogilvie Transportation Center (former Northwestern Railroad station). 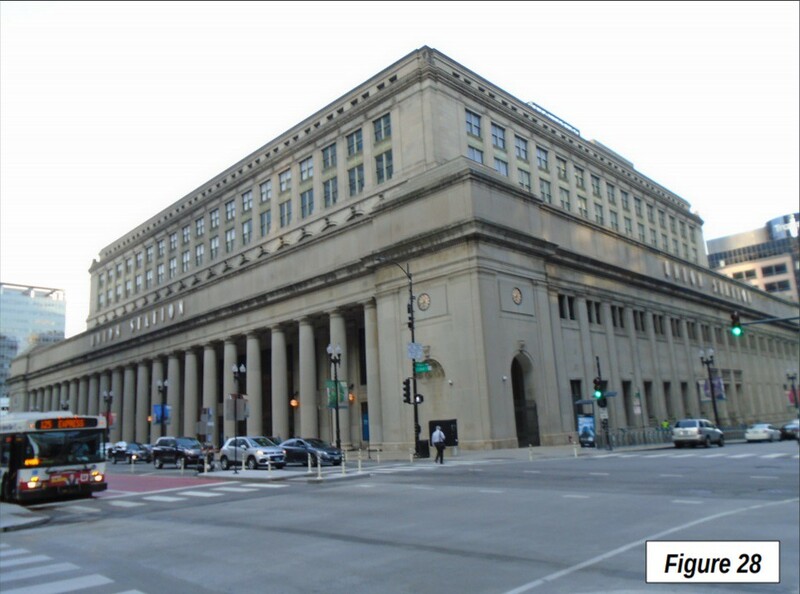 Union Station is located a few blocks south of the Ogilvie Center, both of which are on the west side of the Chicago River (Image 28). 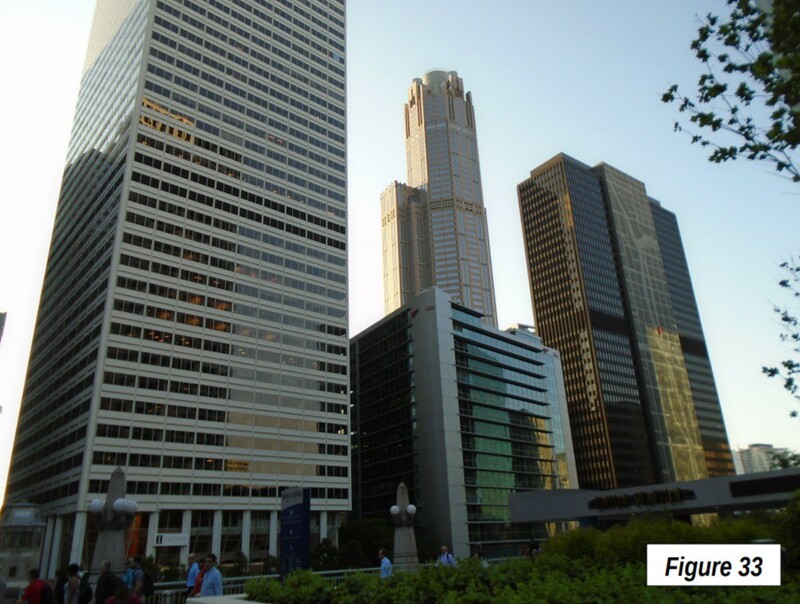 The former Sears Tower (now Willis Tower) was the tallest building in the world from 1974 until exceeded by the Petronas Twin Towers in Kuala Lumpur (Malaysia) in 1998. 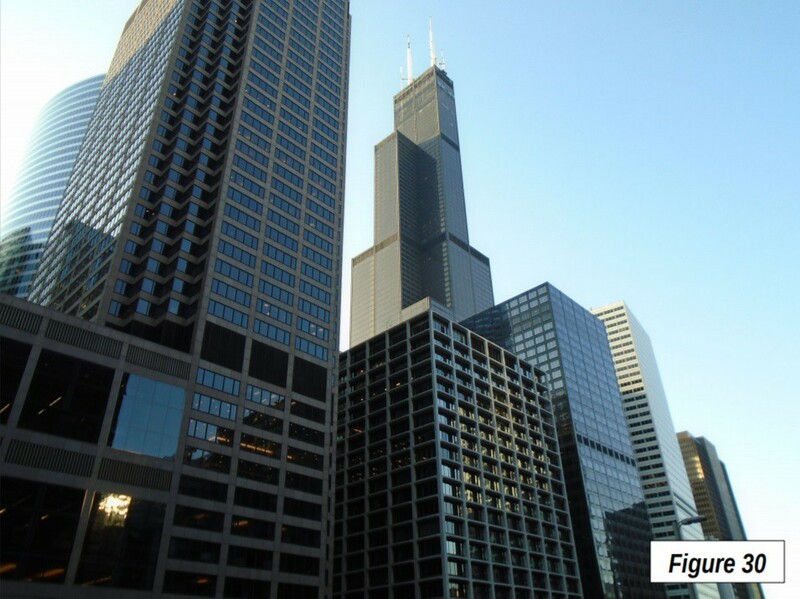 It remains the tallest in both the United States and Chicago’s at 1,451 feet/442 meters and 108 floors (Images 29-32). 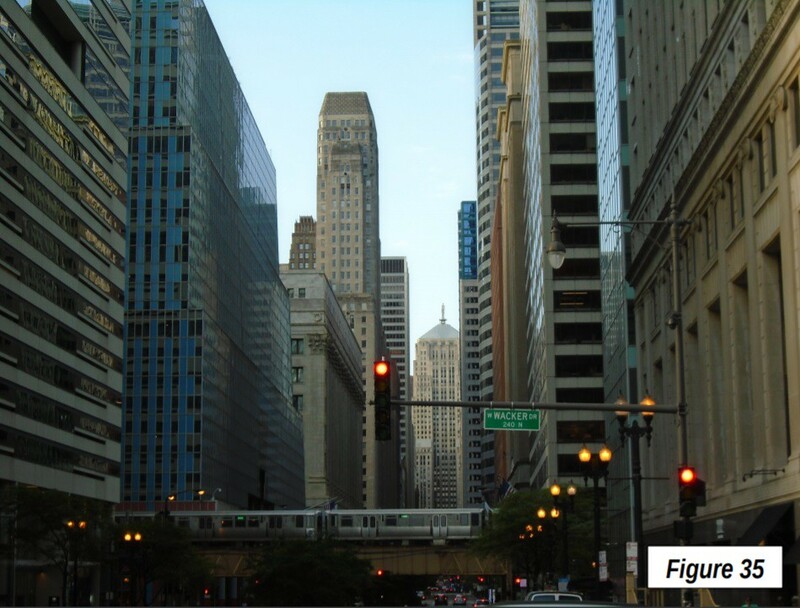 Inside the El loop, there is stronger representation for the skyscrapers build in the “golden years” of such US development between the two world wars (Images 34-41). 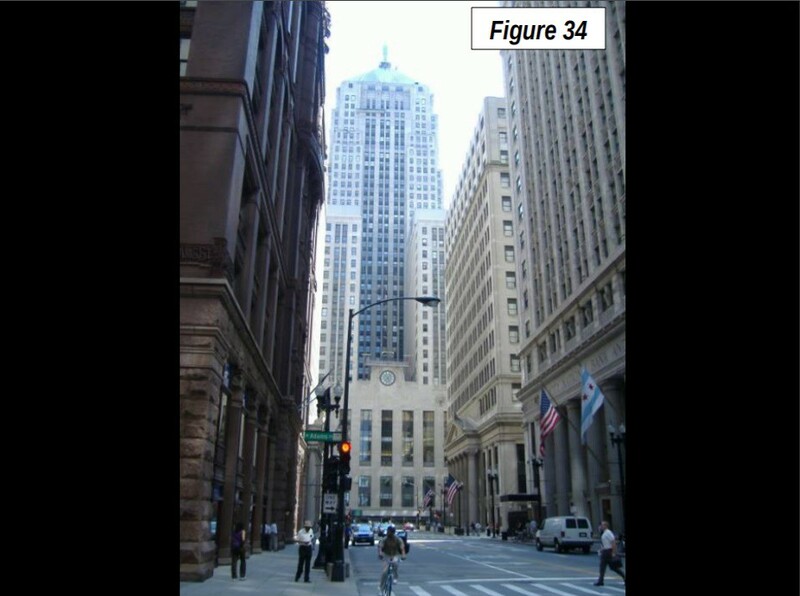 The Art Deco styled Chicago Board of Trade (Image 34) was the tallest building in Chicago from 1930 to 1965 (505 feet/184 meters and 44 floors). 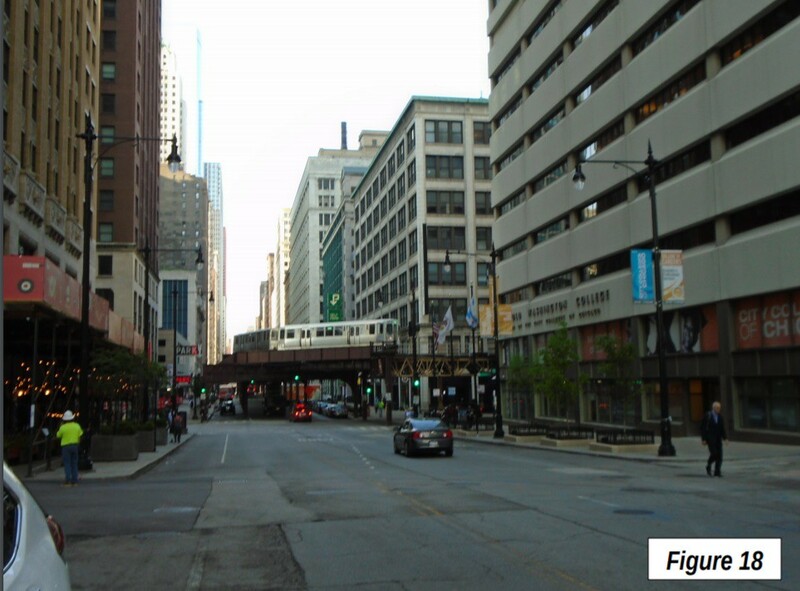 The Board of Trade is located at the end of LaSalle Street, shown with the Lake Avenue El in the foreground (Image 35). 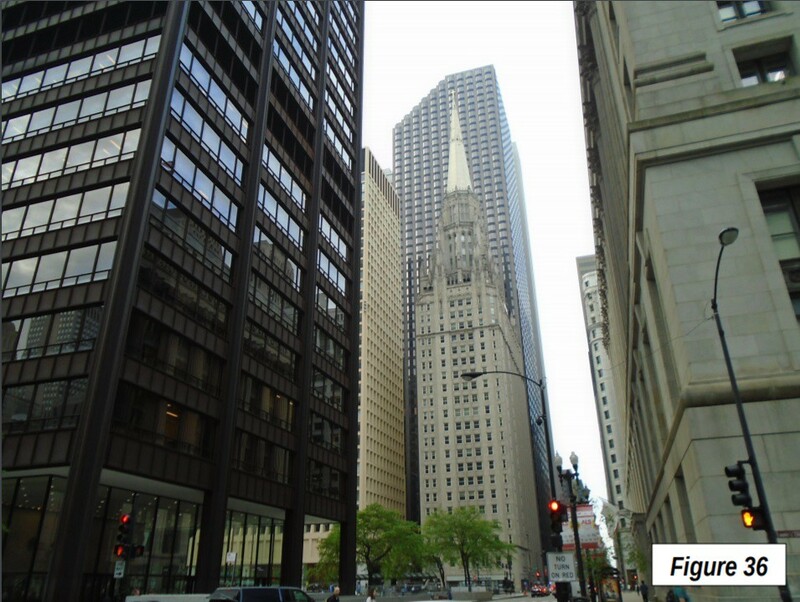 One of the most unique skyscrapers in the world is the Chicago Temple, built by First Methodist Church as an 23 story office building of more than 500 feet, with the church sanctuary on the top floor. The church was established 187 years ago and is the oldest in Chicago (Image 36). 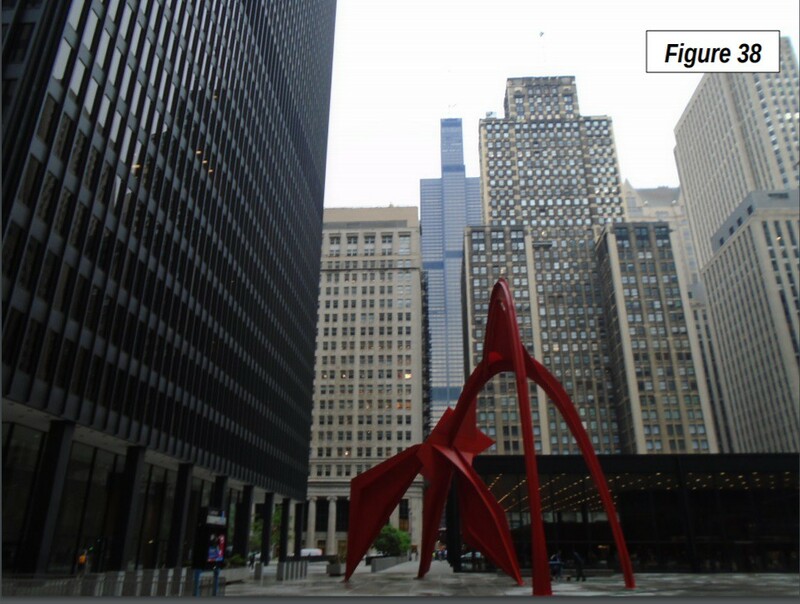 It is across the street from the Richard J. Daley Center, with its Picasso (Image 38) and the City-County building (Image 39). To the left of One Prudential Tower is the much taller Aon Building (former Standard Oil of Indiana Building), which was briefly the tallest in the city when completed in 1973 (1,136 feet/346 meters and 83 floors). 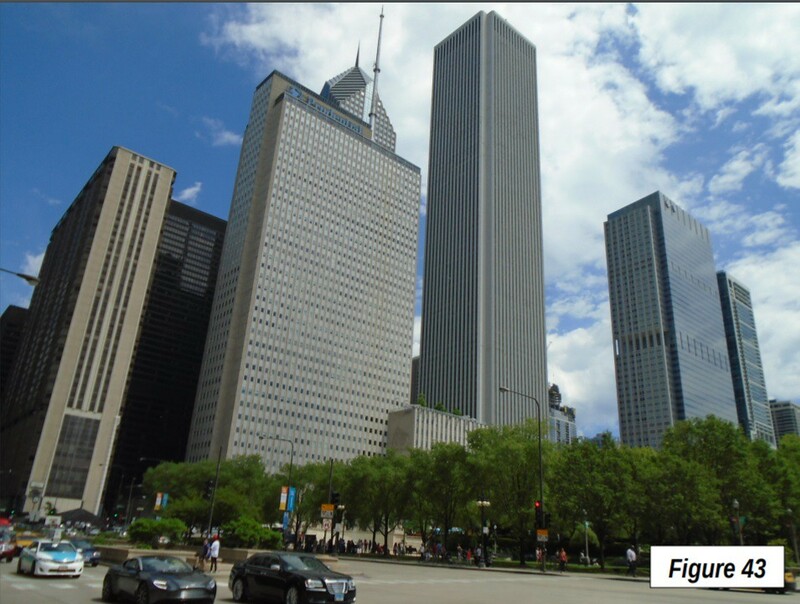 Behind One Prudential Plaza is Two Prudential Plaza, a 1990 structure that always mystified me. 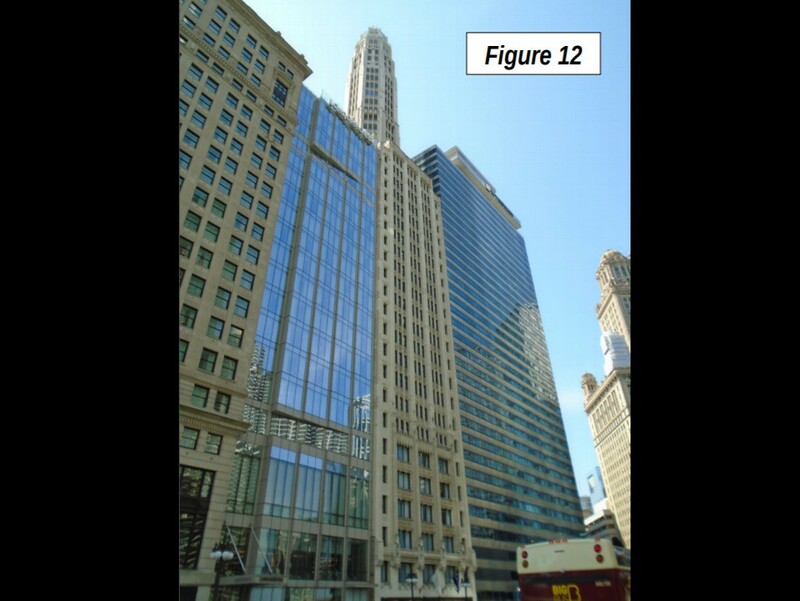 It is considerably shorter than the adjacent Aon Building (995 feet/303 meters), yet it is topped with spire design typically associated for a “tallest” building. 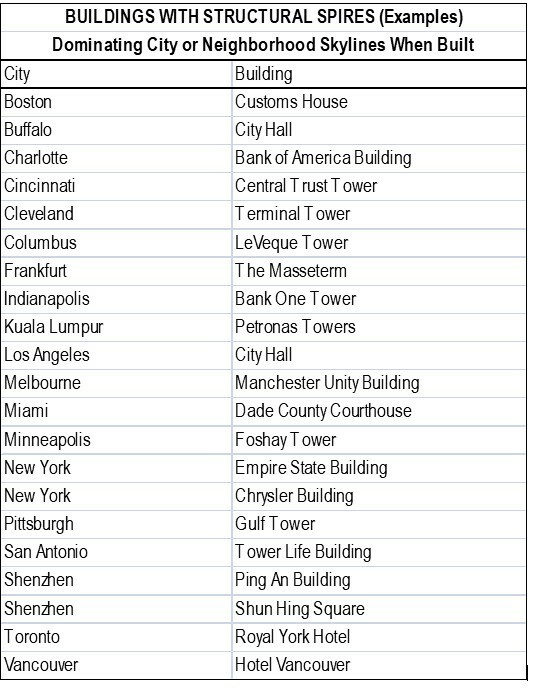 Like Two Prudential Tower, other buildings have a broadly similar structural spires (see examples in the table below). 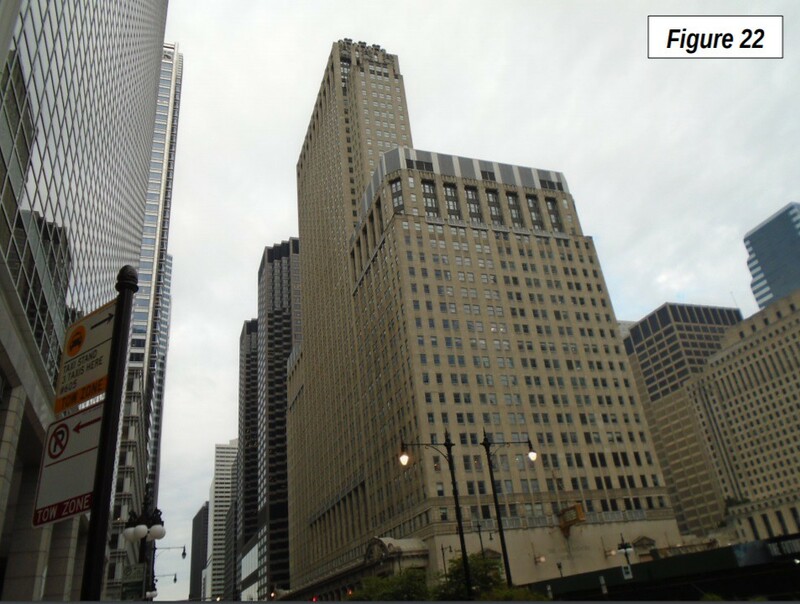 But Two Prudential Plaza’s vertical dominance did not cross the street, not even when the architectural renderings were approved . 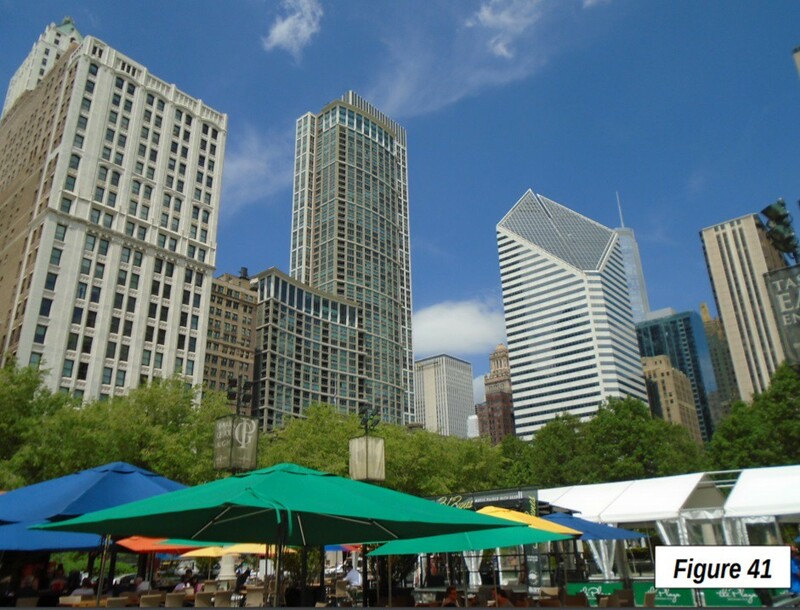 Despite being newer, is virtually in the shadow of the Aon Building until mid-day every day. 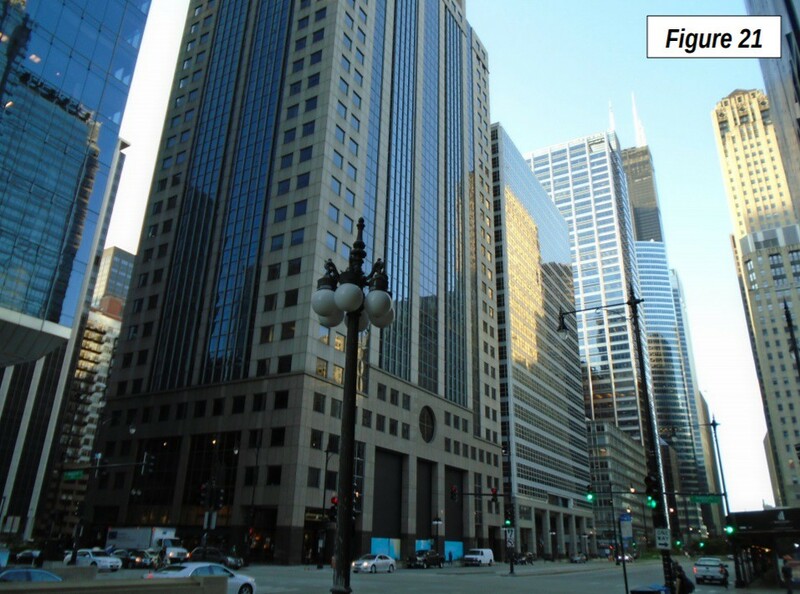 The former Conrad Hilton Hotel, headquarters for the 1968 Democratic National Convention (which selected Hubert H. Humphrey as its candidate for president) is at the next intersection (Image 44). 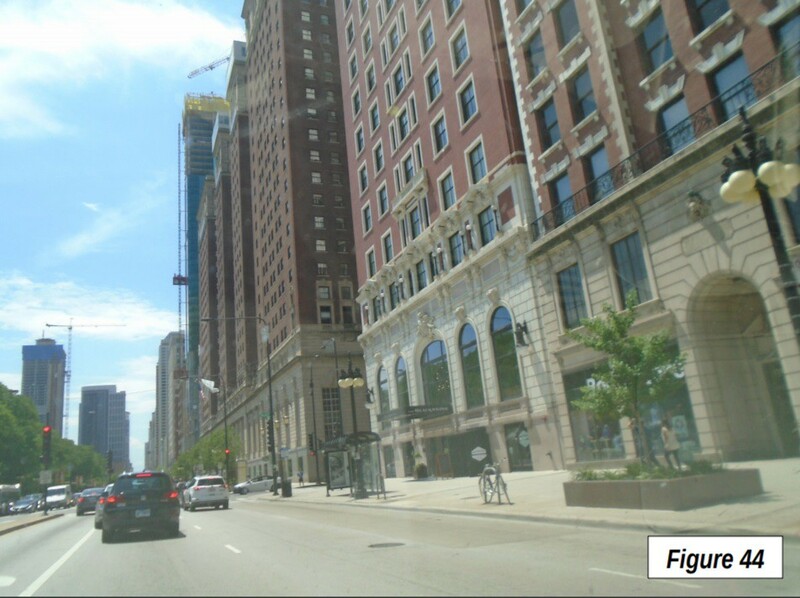 Considerable redevelopment is occurring along South Michigan Avenue (Images 45-46). 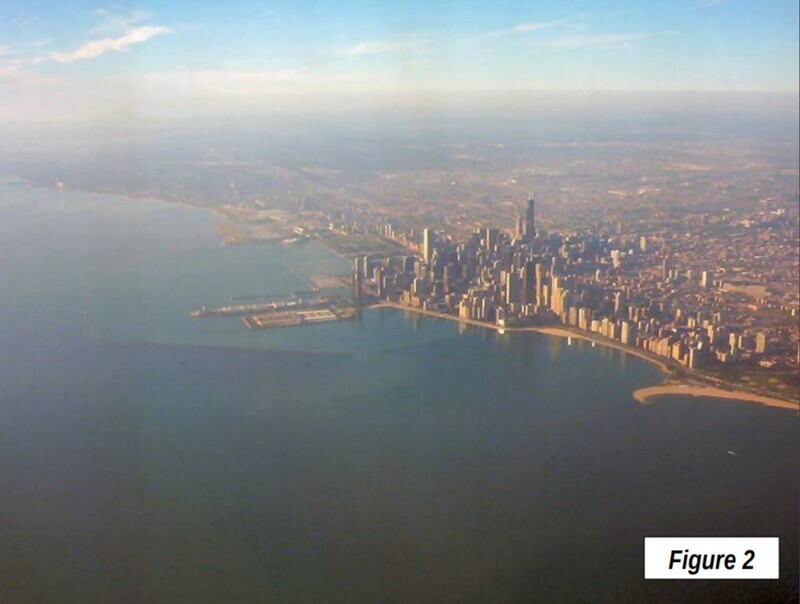 Chicago and New York, in my view, have the world’s most incomparable skylines. The key is their pre-automobile development patterns, with buildings right up to the sidewalk. 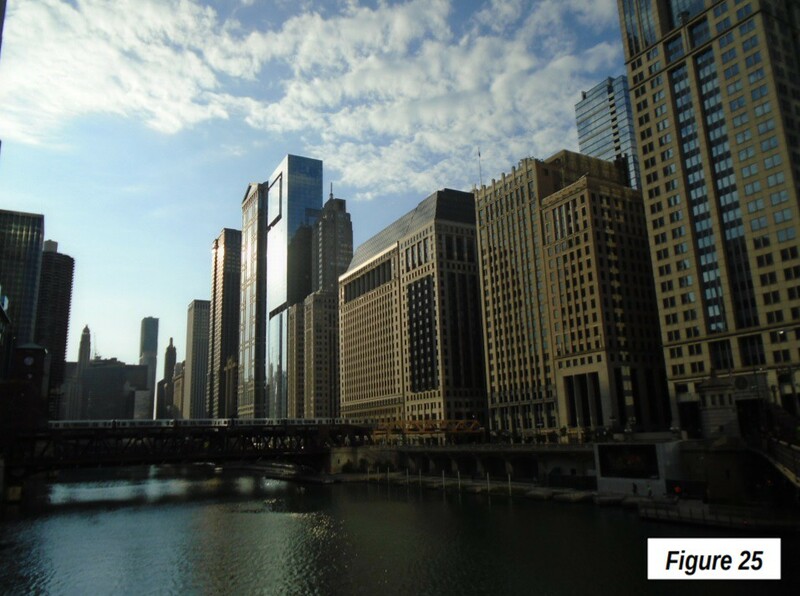 The distinction is clear just comparing the Loop, Midtown Manhattan or Downtown Manhattan with Chicago’s River North. 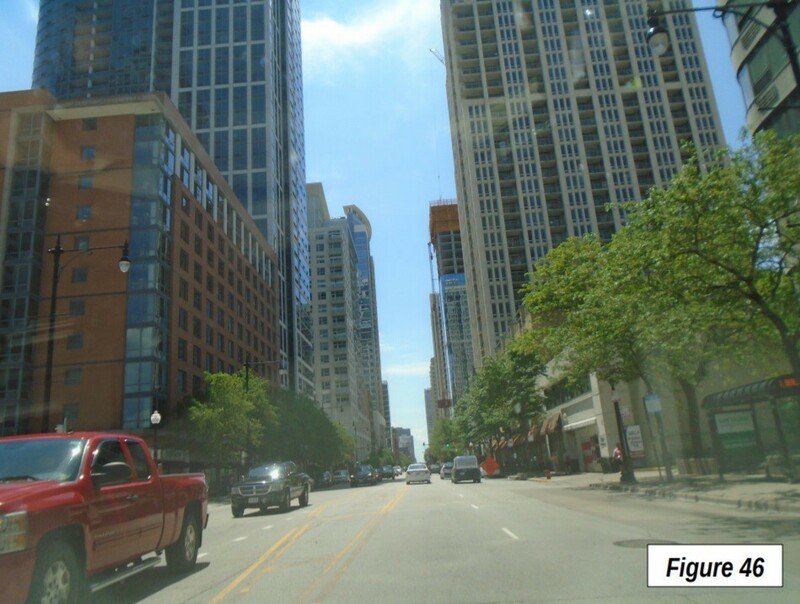 River North has some of the tallest buildings in Chicago and the United States, yet it does not have the “canyons” of dense development as are indicated in Image 27. There are a few places in the world that have tried to emulate such CBD intensity, but wannabes like Toronto to Philadelphia and San Francisco, fall far short of Chicago and New York. There will not likely be another downtown like them in the years to come. Note 1: All of the photographs were taken on the walk, except Images 2, 4 and 34, which were taken earlier. 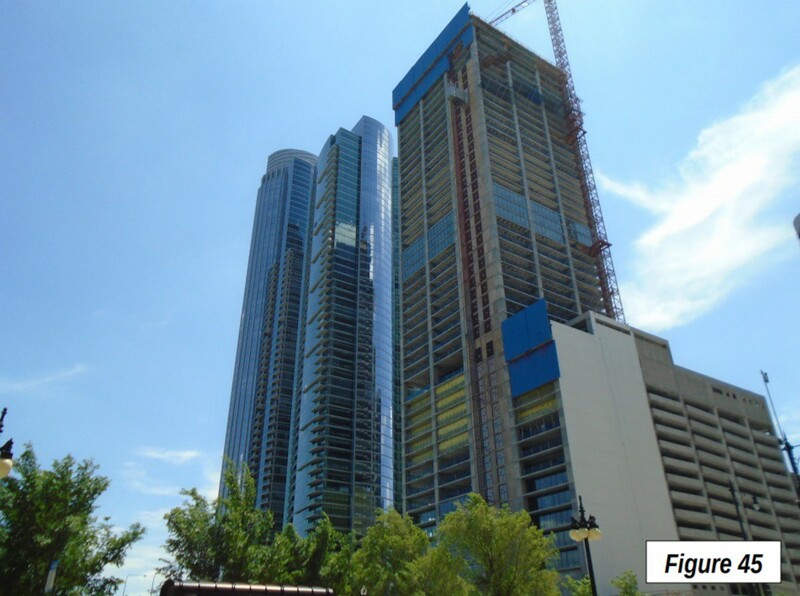 Note 2: Many newer skyscrapers are supported with reinforced concrete (strengthened by rebar), while others are supported by combination of steel and reinforced concrete. The tallest reinforced concrete building in the world is 432 Park Avenue in New York according to the Skyscraper Center. At 85 floors, it is 1,397 feet/432 meters.